Hundreds of students who passed through the gateways of IAST are now playing important roles in several organizations and steering the industry. These alumni play a major rolein taking forward the values of the institution. 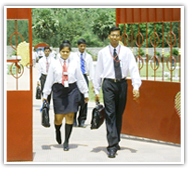 IAST has distinctive alumni programs and services to ex students. On completion of your course at IAST we would like to remain in contact with you to share mutually the latest happenings, trends, experiences, careers, opportunities and activities pertaining to the hospitality industry. We request you to update your contact information by filling the details asked in the alumni form. Connect is an initiative to keep in touch with the alumni through social networking sites like Facebook, Twitter and Linked in. “Studying at IAST is definitely an extra-ordinary experience-a lifetime opportunity to be in the midst of some renowned scholars of the industry and learn from them. The study program helped me gain a complete perspective of strategy, leadership, execution and competitive skills. This experience has had a definite positive impact on my life and career and remains green in my heart”.